The formation of public policy on immigration can be complex. Congressional policy making is usually done through the lawmaking process. In 2006, immigration proposals in Congress began to take shape after President George W. Bush proposed a guest-worker program to address the issue of unauthorized immigration. A member of the House of Representatives proposed an immigration bill, starting the lawmaking process. The proposed bill was given a number and referred to the Judiciary Committee. Each committee in the House studies proposed policies. It may hold hearings and call experts to testify about the need for and effects of the new law. Those opposing the bill also might testify. The committee then debates the policy and votes on the bill. If it is approved by a majority of the committee, it is sent to the whole House to consider. An immigration bill, without a guest-worker program, was approved by a majority of the Judiciary Committee and sent to the floor of the House for debate. Many amendments were proposed to the bill on the floor. Twenty-four were eventually adopted and added to the bill. The House then voted 239 to 182 to pass the bill. At the same time, an immigration bill was moving through a parallel process in the Senate. The Senate bill differed greatly from the final House bill. For example, it included a guestworker program and a path to citizenship for undocumented workers. When the Senate bill passed with a vote of 62–36, the House and Senate immigration bills could have gone to a Conference Committee made up of senators and members of the House. This committee must compromise and reconcile the differences in the two bills. The bill can then be passed by both the House and Senate and sent to the president. If signed, the bill becomes a law and a new policy is established. If the president vetoes the bill, Congress might override the veto if two-thirds of both the Senate and House vote to do so. Or Congress might modify the bill to meet the president’s concerns. Throughout the lawmaking process, the public has opportunities to influence the outcome. 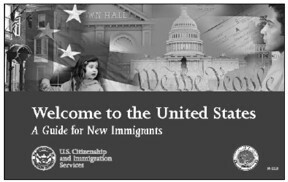 With a new immigration bill, advocacy groups such as the National Immigration Forum and the Center for Immigration Studies might track the bill and provide their members with information. Lobbyists might try to sway legislators. Letter-writing campaigns could be organized. The news media—in print, on the radio, on television, and on the Internet—might present editorials, stories, and opinion polls on the proposed policy. Congress is not the only branch of government that makes policy. Executive agencies of government also make policy. If Congress, for example, were to pass an immigration law with a guestworker program, the law probably would not describe all the details of the program. Included in the law would be "enabling legislation." This is a provision requiring that the appropriate executive agency more clearly define what is required by the law and set policies for putting it into effect. The law would be referred to the Department of Homeland Security, which controls immigration enforcement. The department would work to develop regulations for the guestworker program. This might entail holding public hearings around the nation. Once the regulations were decided on, a document would be produced and sent out for public and expert comment. The final regulations would be subject to congressional oversight. Policy making is not always an easy process. For example, the leadership in the House and Senate decided not to put the two 2006 immigration bills into a Conference Committee. The leadership believed the differences were too great to reconcile. Instead, the House passed a new bill authorizing the building of a 700-mile fence along the almost 2,000-mile Mexican border. The Senate passed a similar bill, and President Bush signed it into law. Comprehensive immigration reform would have to wait. In making policy, deep disagreements can erupt at almost any stage. Sometimes people disagree about the goals of a proposed policy. Does our society really want to pursue that goal? Other times people agree that the goal of the policy is good, but argue that the proposed policy will not help achieve it. Sometimes questions arise about the motivations of the policy makers. Are they creating a policy to benefit one segment of society over another? What groups or points of view are influencing their judgment? All policies have consequences. That is, something will happen as a result of the policy. Who will benefit from the policy? Whose interests might be harmed by the policy? Disagreements can arise about what the consequences will be and who will benefit the most. Others worry that a policy might have consequences that are difficult to predict and might end up doing more harm than good. On some issues, agreement about policies is difficult or impossible. In the pre-Civil War years, America was deeply divided on the issue of slavery and its expansion into new states and territories. Congress and various presidents all tried to establish policies that would address the issue, but none ultimately succeeded. The differences in values, principles, and interests of those opposing and supporting slavery were too great to overcome. When such a divide exists, it is difficult to create policies to resolve such an issue. What is public policy? Give an example of a public policy, tell which major groups are interested in it, and explain their positions. Who makes public policy? Give an example of a process for making it. How and when can citizens influence the making of public policy? Why might it be difficult for people to agree on some issues of public policy? Give a modern example of a highly controversial issue of public policy.